How do I assign my students work? Assignments are used to send work to your students. Students access their assignments from the student dashboard. Once your students log in, then all active assignments are presented for them to complete. When you generate an assignment for your students, different assignment options are available depending on the specific type of content you are assigning. Adaptive Learning content can be assigned to your whole class or individual students for differentiation. To select the Adaptive Learning content to assign, first click on the Content tab, then select Grades 3-7 under Adaptive Content to filter only the Adaptive Learning content. Hover over the desired content, and press assign. If you are on the free tier, then you may need to unlock your free content first. To make the assignment, press the Assign button. Teacher-Led: Designed for a teacher-led discussion, where you control the pacing and progression of the questions presented to the students. Self-Paced: Designed as an independent activity, students work at their own pace solving the questions you have pre-selected for them. To complete the assignment, you’ll want to specify which class(es) or student(s) the assignment is intended for. You can assign to an entire class, multiple classes, or to individual students for differentiation. To make an assignment for a specific class, select the class name from the drop-down menu. To make an assignment to multiple classes, select Assign to Multiple Classes from the drop-down menu. To assign to specific students, first select your class, press Assign by Student, and then select the student(s) that should receive the assignment. With all assignments, the Assignments section of the teacher dashboard displays the student progress for the assigned Adaptive Learning and Formative Assessments, and the Analytics section displays further results for the Adaptive Learning assignments. 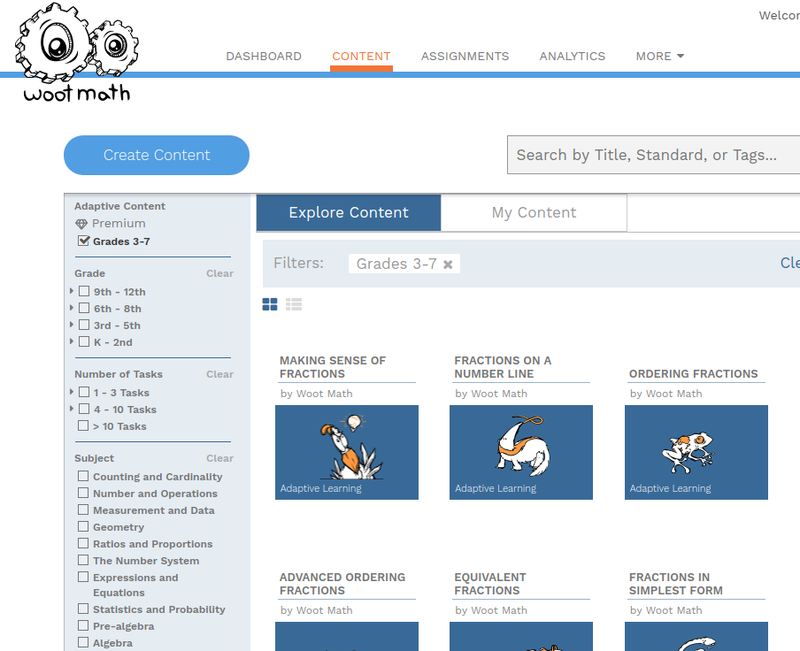 PrevPreviousWhere should my students start with Woot Math Adaptive Learning?